Lewes Speakers Club’s community outreach programme is based on two principles. Firstly, the need to always find new members. Secondly, our intention to continue the principle set forth by Ralph Smedley to help people in the community. Lewes Speakers Club is a strange club in that since forming in 2012 it’s had a good membership of 25 to 30 people. Yet relatively few of us are from Lewes itself. So we always need to get our name out in the local community. As a committee member I have always know that what I DON’T want from my club is to be cliquey and inward looking. You know the kind of club: smug, always the same old faces, same old speeches, same old banter. The long-term success of a club depends on being outward looking and always seeking out fresh talent. And not just talent; problems too. 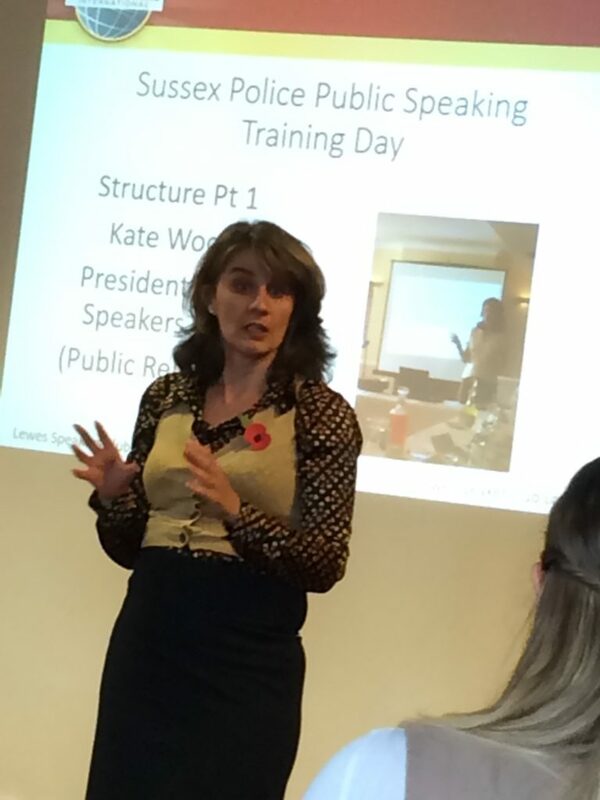 As I always tell people when we meet them at business and networking events, this isn’t a club for people who like public speaking, but for those who need the skills but find it terrifying. And when you start out with that attitude, you can develop quite a campaigning spirit. As it says on the Toastmasters’ website: “Smedley saw a need for the men in the community to learn how to speak, conduct meetings, plan programs and work on committees, and he wanted to help them.” So do we. But calling what we do “the Lewes Speakers Club’s community outreach programme” perhaps sounds grander than it is. In fact, people ask us to help out and we always say yes. That has included, in the past couple of years, helping the police with their public speaking. Our founder member Jeff Grace was giving an interview on the Lewes Bonfire radio station. It’s not a big radio station, but the police appear to listen in. The chief of the local police was so inspired by Jeff that he asked us to come and run a workshop for his officers. Apparently, when reading the local ne’er-do-wells their rights they weren’t using enough vocal variety or the full potential of the stage. Also they needed help when required to address public meetings. So three of us went along and trained 30 or so senior officers. And then they asked us back next year. We also act as judges each year for Youth Speaks, a national competition held by the Rotary Club. It’s fascinating and inspiring to hear state school kids competing in public speaking, and they appreciate that a local speaking club takes the time to offer encouragement and advice. Of course it’s not purely altruistic. For those of us who love to speak and tell our stories and experiences, speaking at a local club for the elderly is a wonderful opportunity. We get to hear a few amazing stories back too. We think that the need continues, to be at the heart of the community. Flourishing. Thriving. Vibrant. These are all words that can describe Area H15 in 2018. So where to start when describing it all? Our electric Area Christmas Party and Speakers of Croydon’s 15thAnniversary? The spellbinding speeches? Awards, accolades and achievements? What inspired you to create a club? I had been thinking about putting on a Public Speaking workshop for a little while, when I was approached by a member of Liberty Christian Ministries and asked if I would help to start a Toastmaster club at their Church; word had got around that I was a seasoned Toastmaster. I remember first meeting Pearl Cadogan (who didn’t know at the time but was to become our VPE) as I sat in Costa Coffee excited and slightly daunted about this new Venture! Where would we start? How would the Demo Launch meeting turn out? What makes Liberty Speakers special? Liberty Speakers Club is special on many levels because an air of excellence permeates throughout the venue. The members of the committee are talented, tenacious and determined that the club will be a success. We all realise that we are on a learning curve so we are patient with each other as well as reaching out to the Toastmaster network to get the necessary knowledge and assistance to fill in the gaps. The ambiance of the venue is welcoming and warm. The meeting is held in the main auditorium in the church and many guests comment that the room is ‘lovely’. During the networking break the guests are provided with drinks and snacks which are well presented; it has the feeling of “Afternoon tea at the Ritz”! What have been the highlights so far of the club? The highlight so far (even though daunting), has been going from zero to Demo Launch; what a learning curve! 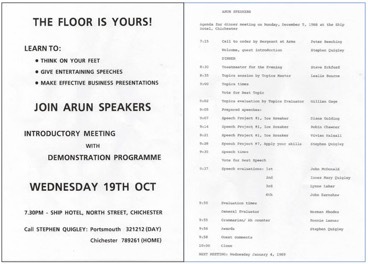 The Demo Launch was held on 15 November, an Eventbrite invitation had been sent out, so we were excited as to the potential number of guests that would be attending. Name badges were in reception, greeters at the door and hospitality waiting in the wings. At 6.45pm it was cameras, lights and action – there was no turning back now! The guests started to filter through the doors, including Florian Bay, (ex Club Growth Director) Arnaud Satre (Club Grown Director) and Sandra Mighty (Area Director and Toastmaster for the evening) – all of whom had held my hand as founding President during the process of setting up the club. It was an exciting evening of speeches and table topics and 56 guests attended! It was better than Pearl or I could ever have imagined when we sat in Costa Coffee over a couple of lattes back in July! I was also presented with a special recognition Toastmaster badge as Founding President which was definitely one of my highlights. As a committed member of Liberty Speakers, your life will definitely change. Members will have the opportunity to Discover, Develop and Demonstrate their public speaking and leadership skills and developing these skills will help to enrich their career opportunities, their leadership skills in the community and communication skills within the family setting and to make new friends. Oftentimes I have heard that people would rather go to their own funerals than speak in public! I would like to encourage anyone who feels that they start to stutter with fear, have butterflies in their stomach or come out in a cold sweat – Feel the stutter but speak anyway because there is a whole new world waiting for you. Fantastic words of wisdom there from Flavia, the Founding President of Liberty Speakers Club! Has that inspired you to create your own club, or create something you are passionate about? Good! Feel the fear and do it anyway. 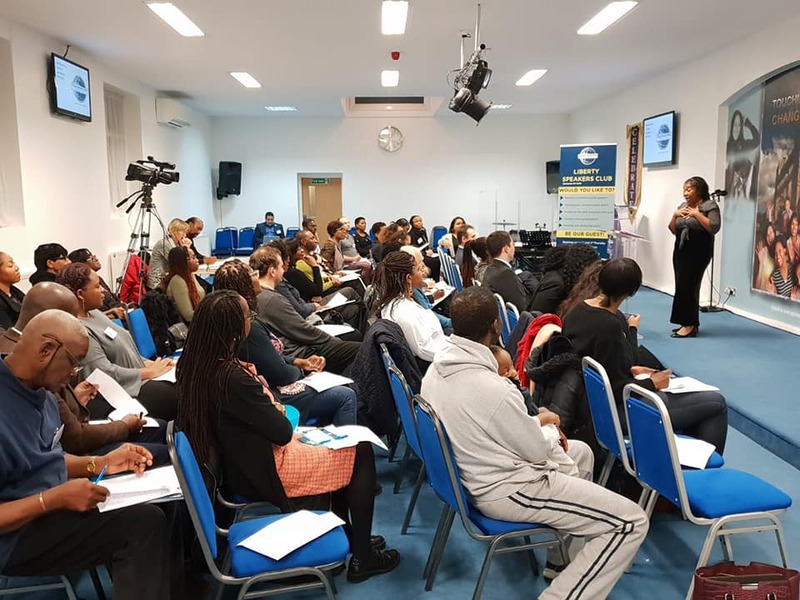 Liberty Speakers Club meets every first and third Thursday of the Month at Liberty Christian Ministries, Norbury and is well worth a visit. Clinical Communicators – a corporate club in rural Horsham! Posted on 27th January 2019 by Seema Menon in Division H, Updates & Posts | Comments Off on Clinical Communicators – a corporate club in rural Horsham! Clinical Communicators is one of two corporate Toastmasters Clubs in Area 32 – the other being County Communicators. The club operates within Fisher Clinical Services UK which is part of ThermoFisher Scientific. ThermoFisher Scientific is a global, American biotechnology product development company. Corporate clubs have particular strengths and challenges, and Clinical Communicators is no different. On the very positive side, as a corporate club, members are offered a corporate subsidy towards cost of membership of Toastmasters Int. and also benefit from the use of free on-site venues and corporate communication channels – for example, the Club has developed a spreadsheet on their shared corporate drive for members to sign up for roles or indicate availability. This is linked to an email system to remind people to sign up for roles which has proved successful. However, retaining members is often a challenge for corporate clubs, but, under the stewardship of Ned, club President, the club has offered innovative new ways to attract and retain members through quarterly Toastmasters events. These have included an Icebreaker Speech Contest, an outdoor session, a Dragons Den Table Topic Contest, a Halloween themed event in October and culminating in an end of calendar year, Christmas themed event. The up and coming Toastmasters Open Day early in the New Year is also something to look forward to. Also, 2018 has been a great year for long-serving Toastmaster, Royce Heap, Club VP Ed, who received the Toastmasters International’s Triple Crown. This is a phenomenal achievement awarded on completion of any combination of Competent Communicator (CC), Competent Leader (CL), Advanced Communicator (AC), Advanced Leader (AL), or Distinguished Toastmaster (DTM) in a single programme year. Congratulations Royce – a great achievement! In addition to strong leadership, the club has implemented a new Information Board which is on permanent display for members to track, DCP Progress, education awards progress and attendance at meetings, including guests. With these strong foundations in place, Clinical Communicators is heading for a successful 2019.